Early Native Americans used plants, and the sugary sap from trees to create sweet treats. People today still enjoy the tongue-pleasing flavors of candy confections. Every culture since the beginning of time has created some sweet-flavored treat to satisfy the palette. And in West Virginia, we sure know how to satisfy that sweet tooth! Read through the 10 best candy stores in West Virginia below and you're certain to find some sweet something! Remember your favorite candy when you were growing up? Whether it was circus peanuts, conversation hearts, salt water taffy, or rock candy sticks, you probably find it at True Treats Historic Candies in Harpers Ferry, West Virginia. Whether you're looking for hard candy, chewing gum, or chocolate, you'll have fun learning the history behind your favorite sweet of choice. The Candy Factory in Charleston, West Virginia, has been selling sweet treats for nearly 40 years. Everything is homemade and visitors can find such wonderful confections as peanut butter cups and colorful candy suckers. If you want to satisfy your sweet tooth, but need to watch the calories, they offer a nice variety of sugar-free candies as well. If you enjoy mouth-watering, delicious Godiva or Neuhaus Belgian chocolates, you have to stop by Slight Indulgence in Morgantown, West Virginia. Open every day except Sunday, if you have a passion for the finer things in life, you'll have no problem selecting one of the many reasonably priced international wines. You can also find your favorite chocolate, coffee, or other sweet something and gift baskets are available. Are you crazy for candy? Are you hosting a large event and need to find a source for bulk confections? Try one of the family-owned and operated Candy Craze locations in Huntington, West Virginia. You'll find over 200 choices of sweet treats to build your own candy buffet for weddings, birthday parties or other events. Homemade fudge, cotton candy, rock candy, and lollipops are among the choices you'll have at Smith Candies in St. Mary's, West Virginia. They also offer a unique candy called a railroad stick and seasonal products for holidays throughout the year. Stop by the shop to watch lollipops being rolled, cut, and wrapped and take home a sample or two. If you want the best in Swiss chocolates, you want to visit Holl's Chocolates in Vienna, West Virginia. Three generations of trained chocolate makers have continuously produced the finest quality candies like the Grand Marnier Truffle, a cognac-infused chocolate with orange overtones, or a classic milk chocolate and whiskey blended truffle. They have milk, dark, or white chocolate almond bark and nut and caramel options, along with sugar free chocolates. No holiday would be complete without chocolate. Visitors at DeFluri's Fine Chocolates in Martinsburg, West Virginia, can choose between peanut butter Easter eggs, wine truffles, molasses sponge, buttercreams, thin mints, or chocolate-covered pretzels. Sugar-free candies are available at the renovated historic retail store or by ordering online. All candies are made with only the finest and freshest ingredients. If you want to raise your happy meter, visit Candy Craft in Chester, West Virginia. In addition to traditional chocolate and candy varieties, this little candy shop carries allergen-free white and milk chocolate wafers and other healthy versions of molded and dipped sweets. They carry a full line of candy and cake supplies and ingredients for those who want to try their hand at making their own sweet treats. 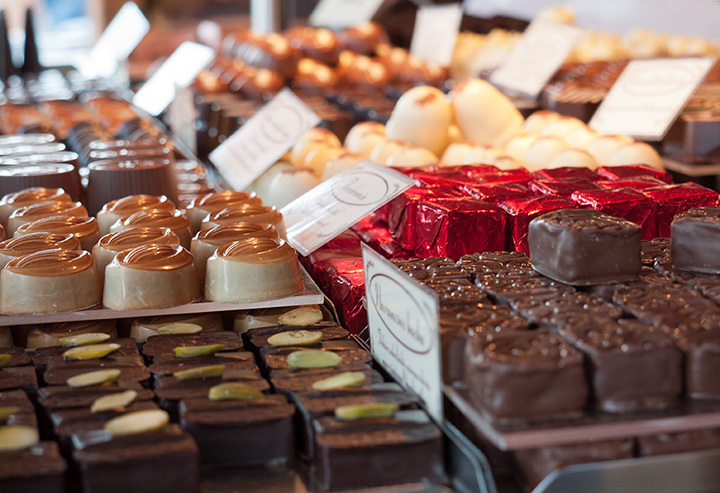 Rose City Chocolatier in Martinsburg, West Virginia, offers some of the largest selections of vegan Belgian and artisan chocolates in the state. The unique plant-based confections are made without using any animal products and with raw or beet sugar as the sweeting ingredient. Try the awesome mouth-watering artisan buttercrunch also known as English toffee, a delightful combination of toasted almonds and dark chocolate. If that doesn't satisfy your need for chocolate, the chocolate, orange, or pistachio marzipan will. One of West Virginia's best kept secrets, EH Chocolates in Kirby, West Virginia, offers additive and preservative-free, all natural Swiss chocolates. Chocolate lovers can choose from an assortment of truffles, chocolate-covered strawberries, Buckeyes or molded chocolate suckers. You won't be disappointed with anything.